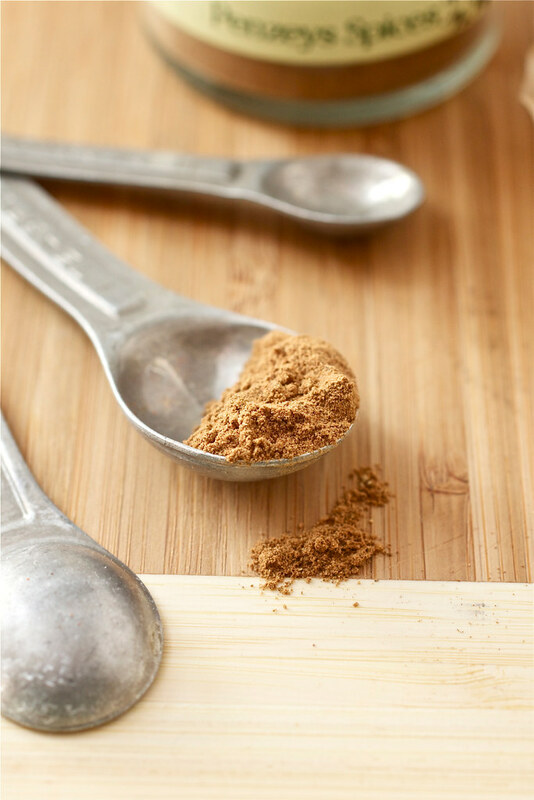 Homemade Pumpkin Pie Spice – 5 min and 5 ingredients are all you need to make your own pumpkin pie spice! I would venture a bet that at least 50% of the pumpkin recipes I look at each year (both old and new recipes) include pumpkin pie spice on the ingredient list. And if it’s not specifically called pumpkin pie spice, it’s some combination of cinnamon, nutmeg, ginger, and maybe allspice and/or ground cloves. 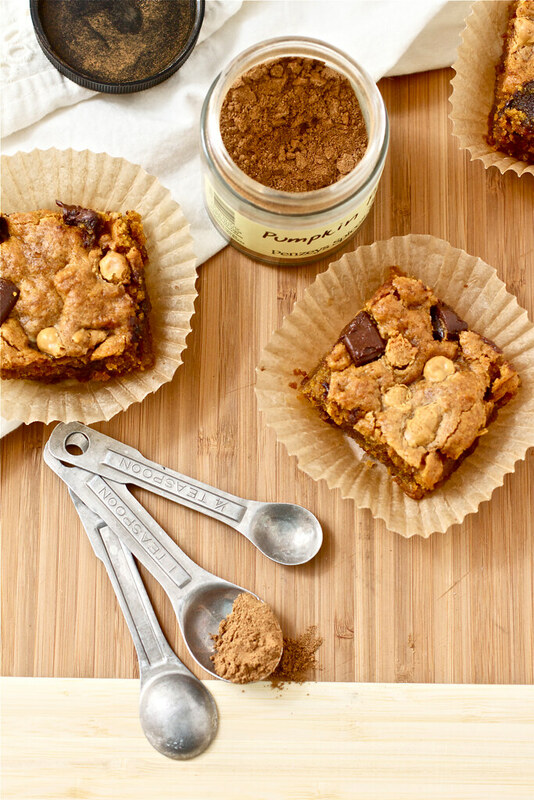 Frankly, I got tired of measuring out each individual spice for recipes like the pumpkin butterscotch blondies (in the photo above) and I refused to spend money on a pre-made spice mix that I could easily make at home. And why not make it at home? Aside from saving a few bucks on the pre-made mix, I already keep all of the necessary spices in my pantry so it was a no-brainer to just combine them all together to make a ready-to-use homemade pumpkin pie spice mix whenever I need it. Like most spice mixes, including this taco seasoning, you can play with the amount of each spice you use in order to get the right combination for you. Your best tool for making DIY pumpkin pie spice is your nose – you’ll be able to smell if the you need to adjust the amounts for your own preference. It’s especially easy with this spice mix because all of the spices have a very distinct scent independently so by taking a whiff, you’ll know which you may need more of. Just be sure you are familiar with how each spice smells on its own before combining them together! If you think it needs a little more cinnamon, add a little more. Or if you’re not a huge fan of nutmeg (like me), add a little less from the start. When you’ve got the right combination, the mix should smell like a hint of pumpkin pie – it’s so easy!! Feel free to scale up on the proportions of this recipe to make extra for all of your fall baking needs or to give as gifts packaged up with a bow in a cute little mason jar! In a small bowl, stir together all the spices. Keep the spice blend in a sealed jar or container for up to 6 months. This is such a great idea since sometimes it is so hard to find pumpkin pie spice! This is a great tip, thanks for sharing! It’s great to know who to make spice mixes yourself. I constantly find myself without the various blends, but it is maintained by the fact that I can make it myself instead! I even make my own taco seasoning because I can omit some of the salt. I just made a batch myself last week when I had discovered I was out, and needed some for the pumpkin cream cheese muffins. So much fresher than what’s in the store, and so much more thrifty too! How clever you are! I never bought the spice mix because it was too expensive. I would just pull those spices out and put in what I felt would be about right, but, as usual, you have taken this to another level, my smart daughter!! What a fantastic idea! I just ran out and cringed when I saw that a small little jar costs $5.99. I will def be making my own! They dont sell pumpkin pie spice in Israel so this is so wonderful!! Thank for sharing. Your photos are so pretty! Ah! This is great. I haven’t been able to find pumpkin pie spice in the grocery store, and have a long list of fall-ish pumpkiny recipes waiting to be baked. Thanks for sharing this! I’m so glad you including the link for the pumpkin butterscotch blondies. They look incredible! Thank you! I am off to make a big batch of this (and some chai spice) now! I will have to check out that taco seasonings to! I love these photos. I’ve been meaning to post about this too, since I often get questions about subs for the spice blend.